a caster, jollier, presser or thrower (q.v.) who makes ornamental articles. a presser (q.v.) who shapes clay into the form of a deep oval article, called a "baker," by hand pressing. a jollier (q.v.) who makes basins with a jolley. a sanitary ware maker (q.v.) who makes baths usually by pressing, but occasionally by casting, bath maker, earthenware; a sanitary ware maker (q.v.) who makes baths of earthenware; (rarely done, baths usually made of fireclay). bores holes by hand, using steel pointed tool, in soap drainers, fish-dish drainers, at the base of teapot spouts, and in other perforated or hollow articles of clayware. generally a jollier (q.v.) who makes bowls by jolleying process; may mould by hand or by jiggering process. a hollow-ware presser (q/v.) who specialises in pressing large bowls for toilet sets, etc. a caster or presser (q.v.) who makes lavatory sanitary ware either by casting or by pressing. a jollier or a presser (q.v.) who makes small bowls, e.g. , sugar howls, known in the trade as "muffin" bowls. a presser or jollier (q.v.) who makes earthenware boxes for potted meats, tooth pastes, etc. a thrower, presser or jollier (q.v.) who makes small fireclay crucibles called capsules. pours clay or fire-clay "slip," i.e. , clay ground in water, into moulds, which are sometimes revolved on a whirler during pouring; when enough clay has been deposited on inside surface of mould, rest of slip is poured out; and mould, with clay adhering thereto, is taken to drying room; sometimes specifically designated, e.g. , china caster, earthenware caster, hollow-ware caster, parian caster, sanitary caster. a turner (q.v.) who places a long tube of clay, formed by throwing or by casting, on lathe, and shapes it into small perforated cylinders, known as castors, runners, or rollers, by applying a steel tool thereto as it rotates on lathe. a flat presser (q.v.) who makes china ware dishes, generally by method of pressing. a pressor or turner (q.v.) who makes finger panels, door knobs, etc., by pressing or by turning; sometimes specifically designated, e.g. , china knob maker. general term for any worker engaged in preparing clay, or shaping articles therefrom, up to first firing (when clay ceases to be plastic), including presser, jollier (q.v.). a caster or a presser (q.v.) who makes pans for closets by casting in a mould or by pressing. a jollier (q.v.) who makes covers for dishes. a thrower (q.v.) who makes cupels, i.e. , small crucibles used in assaying precious metals, by throwing, on potters' wheel, a paste composed principally of bone ash. a jollier (q.v.) who makes cups on a single or double cup jolley; may sometimes be a thrower, turner or caster (q.v.). a flat presser (q.v.) who makes dishes on a jigger or by pressing. a jollier (q.v.) who makes domestic utensils usually on a jolley. a fettler (q.v.) who smoothes edges and joints of clay ware articles with a knife, leather or sponge before firing. trims edges of tiles, and smoothes out slight defects with a palette knife, also removes excess of glaze from tiles after dipping; cf. ware cleaner (118). a die presser, caster or a jollier (q.v.) who makes electrical accessories with a die press, or, more rarely, by casting or by jolleying. a presser (q.v.) who makes electrical fittings of earthenware, usually in a hand or mechanical press, by compression of powdered clay; in some cases, work may be done by throwing, see thrower. a presser (q.v.) who makes tiles and other articles which are to be finished in an unglazed state and which are usually made of clays of different colours, and inlaid to form a pattern. .
assists jollier, caster or presser (q.v.) by smoothing rough edges of articles before they are fired, and my removing irregularities with a knife, leather or sponge. fettles or trims drain pipes; mounts pipes on a vertical or horizontal cylinder turned slowly by mechanical power; applies small rubber or sponge to surface to smooth it and remove defects; removes cracks with a knife, makes grooves in socket and on spigot. a caster (q.v.) who makes statuettes by casting; or, more rarely, a presser (q.v.) who makes them by pressing. moulds relief figures for plastic decoration of pottery; as for flowerer. a fettler (q.v.) who finishes, or makes perfect, defective pieces of terra cotta ware, by hand, with steel and wooden tools, after they have been taken from mould and before they are fired in kiln. applies hand-modelled ornament to terra cotta ware requiring highly ornate figures or floral decoration, after article lias been removed from mould by moistening the clay and pressing on to the article. a jiggerer or a flat presser (q.v.) who makes flat ware, e.g. , plates, etc., either by jiggering or pressing. makes relief flowers for plastic decoration of pottery by pressing clay into a mould with the hands. a thrower (q.v.) who makes flower pots. a drain-pipe maker (q.v.) who makes gulleys for sewers. makes handles for cups, jugs, teapots, etc., by pressing clay into a mould with the hands, and fixes them on to ware by moistening both ware and handle and pressing them together. general term for any worker engaged in making pottery hollow-ware, including hollow-ware caster, hollow-ware jollier, hollow-ware presser (q.v.). a presser (q.v.) who makes electrical porcelain insulators. makes flat-ware such as plates, saucers; presses hat of clay on top of mould, already revolving on vertical spindle; smooths top surface with hand; brings down profile tool on to clay, thus shaping outside of flat ware, the mould shaping inside; cf. jollier. a jiggerer (q.v.) who makes sanitary appliances on jigger machine; work usually done by sanitary presser (q.v.). turns jigger by hand, where mechanical power is not available, for jiggerer or jollier (q.v.) by means of a wheel which drives a belt connected with the jigger. makes hollow-ware by pressing bat or slab of clay into a plaster of Paris mould, which revolves on a vertical spindle; starts spindle and mould revolving and regulates speed; fixes profile tool in clamp and forms inner surface of article by pulling down profile tool into mould as clay revolves (outside being formed by mould): mould and article are then removed to stove by runner (119) (q.v. ); cf. jigger. a pipe maker (q.v.) who specialises in making junctions for drain pipes. makes, by casting, by pressing, or other process, tiles or other articles to he glazed with majolica glazes. see presser ; (term used in London and elsewhere, but not in N. Staffs). a presser or jiggerer (q.v.) who makes small dates, technically called "muffins," by pressing or by jiggering. a pressor or a caster (q.v.) who makes baskets of earthenware by pressing or, for cheaper baskets, by casting. decorates high-class ware by applying relief designs to ware in clay state. a presser or a jollier (q.v.) who makes kitchen pans by pressing or by casting. a caster (q.v.) who casts parian ware, a ceramic ware resembling unglazed biscuit, used for statuettes, etc. a presser (q.v.) who makes small pottery rings, used for thread to run through in textile machinery, usually in a hand press by compression of powdered clay. makes drain pipes by operating pipe making machine; pulls lever to drive plunger; directs workers filling cylinder with clay and removing pipes when made; oils working parts of machine and watches proper working. a presser (q.v.) who makes plaques usually by flat pressing. a presser or a jollier (q.v.) who makes plates either by flat pressing or by jolleying. 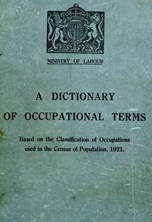 (ii) sometimes used in an even more general sense, as applying to any person employed in any occupation in a pottery. makes finger plates, door knobs, castors, and similar articles, usually in a mechanical press by compression of powdered clay. makes articles by pressing clay into mould; when two or more moulds are needed for one article, fills one mould, straps on another and fills it, and so on, to make complete article; rubs joints in clay smooth with a sponge. makes tiles and other articles by placing finely disintegrated clay dust, which is slightly moistened, in a screw-driven press; releases wheel which presses die into box containing the clay dust and compresses it; occasionally, for certain types of tiles, uses plaster clay. makes plates and other flat articles by pressing on a mould, to form inside of article, clay which has previously been made into a "bat" by batter (119) (q.v.). a presser (q.v.) who makes bowls, jugs, vases, pots, and other similar articles by pressing clay into moulds. a presser (q.v.) who works plastic clay with the hands into a mould rotating on a whirler, until mould is full. makes certain classes of sanitary goods by pressing j prepared fire-clay paste into a mould, usually of plaster of Paris, with his hands, using simple pads and other j tools; examines partially dried article, touches up defects and smooths out roughness or small cracks. a presser (q.v.) who makes articles of terra cotta by pressing plastic terra cotta clay, i.e., a brown clay of special consistency, with the hands, using simple pads and other tools, in a mouldy which contains shape and decoration of article. tile maker, dust tile maker: a die presser (q.v.) engaged in making tiles. .
makes, by throwing, pressing or other process, articles such as breadpans, etc. out of red clays round in various districts. a die presser (q.v.) who makes saddles, or strips of clay with sharp edges, on which ware rests while in sagger, i.e.. fireclay box in which ware is placed for firing. (ii) makes large articles, baths, tanks, by gradually building them up, with lumps of clay by hand, with or without the use of moulds. a jiggerer (q.v.) making saucers. a fettler (q.v.) who trims, by hand with a knife, each piece of scolloped ware, in "green" or clay state, before it is passed to sponger or clay-ware (q.v.). a die presser (q.v.) who makes small earthenware or porcelain rings, or "eves," for shuttles of weaving looms, by pressing damn clay dust, i.e., finely disintegrated clay, in a die. a potter (q.v.) making silica ware, i.e., high class earthenware pottery of silica. a presser or caster (q.v.'! who makes sinks and troughs usually by pressing till sometimes by casting. applies a pattern to pottery in the green state by blowing on coloured clay slips, e.g., by tube lining (cf. tube liner), or by "pate-sur-pate" method, i.e., by squeezing on a design in clay on surface of article. (ii) see sponger, flat; cf. smoother (118). removes, with a damp sponge, any unevenness from ware in clay state, i.e., before firing. a sponger of clay ware (q.v.) who rubs smooth any joins or inequalities in ware made by flat presser, plate maker or saucer maker (q.v. ), in preparation for drying and firing. a caster or presser (q.v.) who makes snouts of teapots, jugs, etc., and fixes them on to article with damp clay. (iii) fastens relief flowers, which have been moulded, on to ornaments. a die presser (q.v.) who; makes "stilts" used to support dipped ware during glost firing, to prevent articles sticking together when glaze melts; cf. spur maker. a thrower or a presser (q.v.) who makes stoneware bottles, e.g., ginger beer bottles, hot water bottles, ink bottles, etc. a jollier, a thrower, a caster or a presser (q.v.) who makes jam jars, insulators, beer bottles and other similar articles of "stoneware," i.e.. ware made from clays having a large proportion of free silica, and usually requiring only a single firing; sometimes specifically designated, e.g., brown stoneware maker. a sanitary caster (q.v.) or a sanitary caster (q.v.) who makes lavatory basins, known in the trade as "tables." a presser or a caster (q.v.) who makes taps, bent pipes, etc., of china, porcelain, or earthenware, used as fittings for vessels for holding acids. a caster or a jollier (q.v.) who makes teapots by casting or by jolleying. a presser or a caster (q.v.) who makes porcelain terminals for electrical work. doctors, or makes good, faulty pieces of terra cotta ware after they have been fired in kiln, by filling in or "stopping" holes or other imperfections with a mixture of plaster of Paris and clay slip, coloured or stained to match body of ware, using a knife or small stick of wood. a die presser (q.v.) who makes "thimbles" of clay, which fit into one another, and are used to support, and to keep separated, dipped ware while it is being fired; cf. saddle maker, spur maker, stilt maker. works on a ball of clay rotating on a small revolving table or "thrower's wheel," and fashions therewith all kinds of artistic shapes with his hands, generally without using any tools, tile maker,see presser, tile; sometimes specifically designated, e.g., decorated tile maker, faience tile maker, fancy tile maker, glazed tile maker, tesselated tile maker, vitreous tile maker. a tile presser (q.v.) who makes porcelain tiles which are not to be glazed. a tile presser (q.v.) who makes tiles which are afterwards decorated with enamel, i.e., "on glaze" decoration. smoothes clay ware articles, after they have been made, by pressing a piece of tow against them while they revolve on a small round table upon which is fixed a mould covered with canvas to hold the articles in position; manipulates revolving table by means of pulley gear worked with the knee. a sanitary caster or a sanitary presser (q.v.) who makes drain traps and pans for water closets either by casting or by pressing. a sanitary caster or a sanitary presser (q.v.) who makes troughs, either by casting or by pressing. a slip decorator (q.v.) who blows coloured slip through a tube on to ware while it is on lathe; sometimes done by turner (q.v.). smooths jolleyed, pressed or thrown ware by pressing a steel tool against it as it revolves on a lathe; often also does work of slip decorator (q.v. ); sometimes specifically designated, e.g., china turner, china knob turner. a turner (q.v.) who turns electrical porcelain insulators on a lathe, after they have been thrown or pressed by insulator maker (q.v.). to complete shaping process and to produce a smooth finish before they are fired. a caster or a presser (q.v.) who makes urinals by casting or by pressing. a presser (q,v.) who makes large vessels to hold acids, generally by pressing. general term for any operative engaged in making pottery from clay in plastic state; includes plate maker , saucer maker, ewer maker, basin maker, bowl maker, dish maker, muffin maker; does not include those who make articles from liquid clay, or slip, by moulding process.